Rain drops on vanilla leaf in forest. in the office space he set up for me. The wild back yard here is carpeted with large, thin Vanilla Leaf plants and Kevin brought me a bouquet of them for my desk one morning. 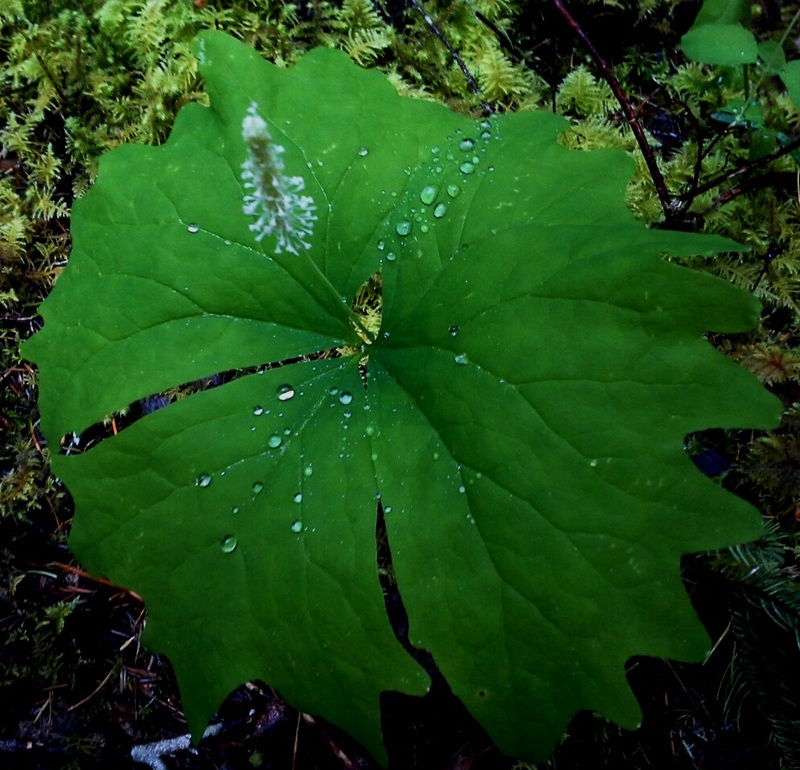 Vanilla Leaf, achlys triphylla, also known as Deer’s Foot and Sweet After Death. That last name is in reference to the vanilla smell of the dried leaf. 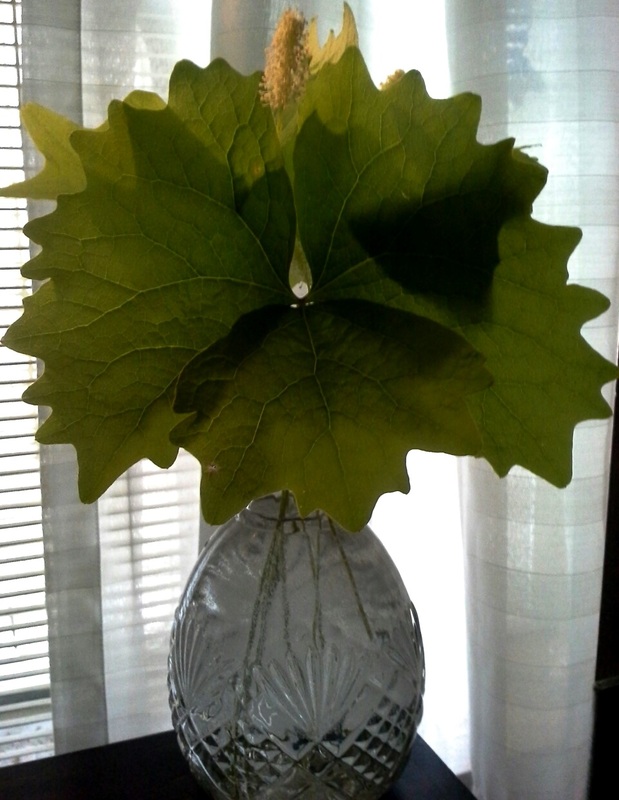 Both dried, and fresh leaves, are said to repel flies and mosquitoes. When I got here to Kevin’s house in Packwood, WA last Friday, we set straight to unloading the gardening goodies that I brought. The seeds that we started in March, along with those Kevin has planted since then, are all ready to be transplanted to their own pots. Just before I arrived, Kevin got a small box in the mail from my mom. She sent us some yellow fragrant day lilies from her Alaska garden! We’ve been rained-in since then. One day, I kept looking at the vanilla leaf bouquet and thinking about all the amazing understory plants that were coming up in the nearby forest. There is a very distracting book shelf next to my “new” desk and I just couldn’t help myself…I found a favorite, which I also have at home, Northwest Foraging by Doug Benoliel (1974). Each plant has line drawings by Mark Orsen that are almost as good as color photos, especially when coupled with the perfectly detailed plant descriptions. Then I came across the 1984 edition of Plants and Animals of the Pacific Northwest by Eugene N. Kozloff. There are 3 sections with very good color photos of the trees, plants, moss, fungus, snails, slugs and a few common bugs in our woods and fields. That’s it, I proposed a walk! 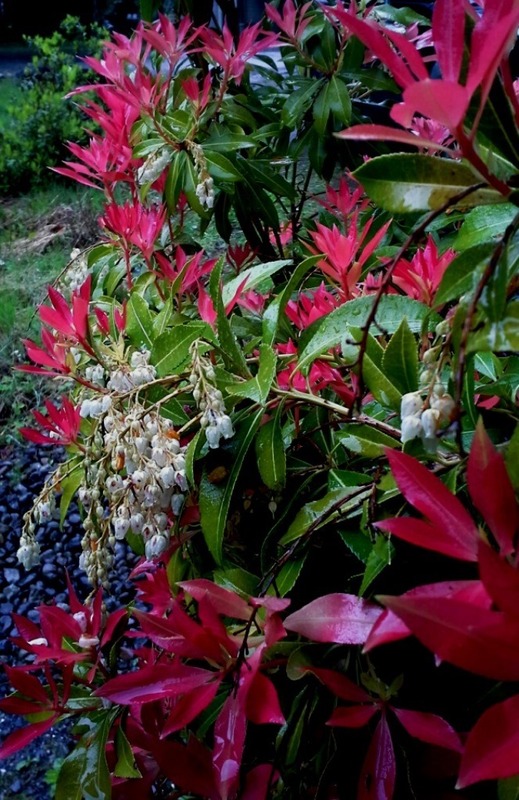 Kevin and I pulled on our rain coats and our rainy walk began with the colorful Mountain Fire, pieris japonica, shrub in his front yard. Next, a bright pink flowering fruit? tree in a neighbor’s yard. I’m still using the camera in my phone and downloading to email, then to photo file on my hard drive is a tedious, slow process. Kevin brought his camera, but had battery issues. I don’t care. I am maddeningly determined to show you our woodland discoveries! 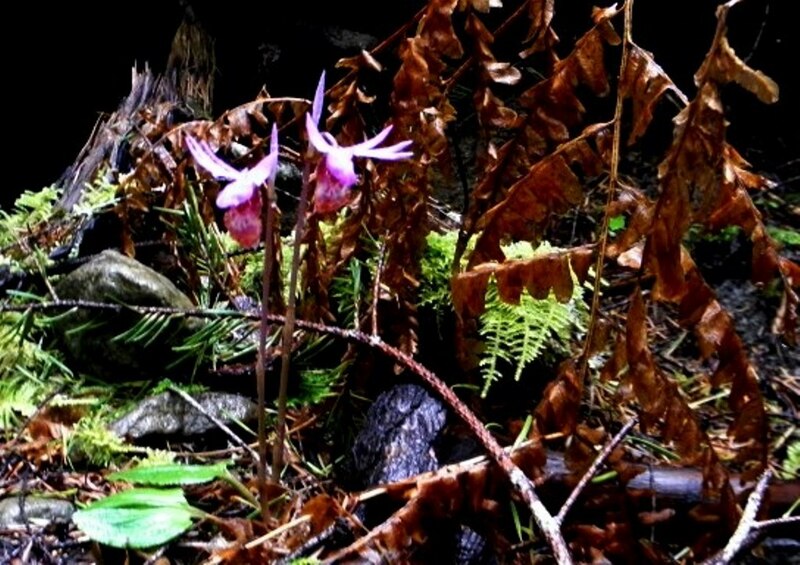 Entering the forest trail, the first plants are the Vanilla Leaf, Oregon Grape, and the delicate and mysterious Fairy Slipper, calypso bulbosa. She’s a pretty one, but aside from several dozen at the beginning, we (Kevin) only saw one more all the way to the falls and back. Another of my favorites is the Smooth Violet, viola glabella, with its tiny yellow flower and heart-shaped leaves. We saw trillium ovatums, but well past their flowering stage. Hugging the ground in sunny spots, were the white little wild strawberry flowers. The Indian Plum/Oso Berry, oemleria cerasiformis rose from waist high, to above our heads. 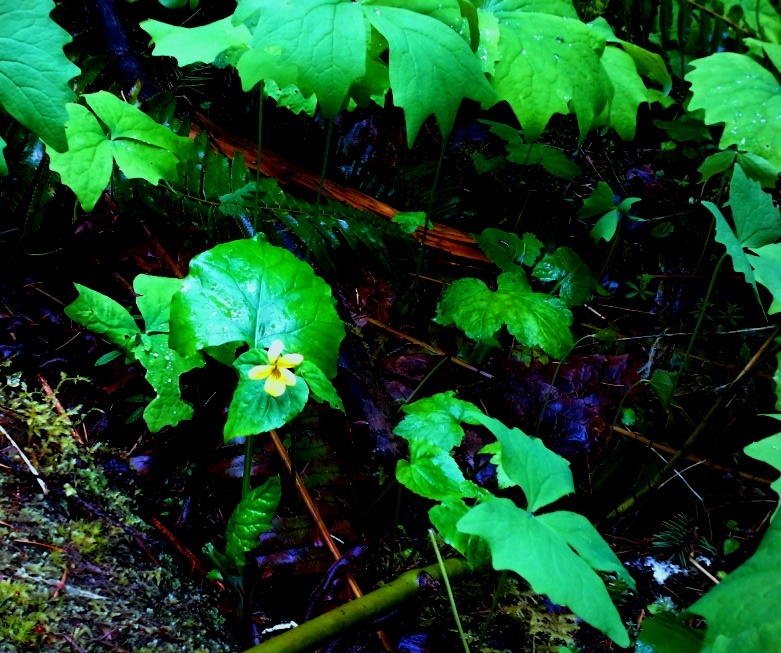 They were still dripping with flowers and bright green new leaves, which smell like cucumber when crushed. These small trees will yield the first ripe berries in the woods, but the birds eat them so quickly, humans rarely get to see them. 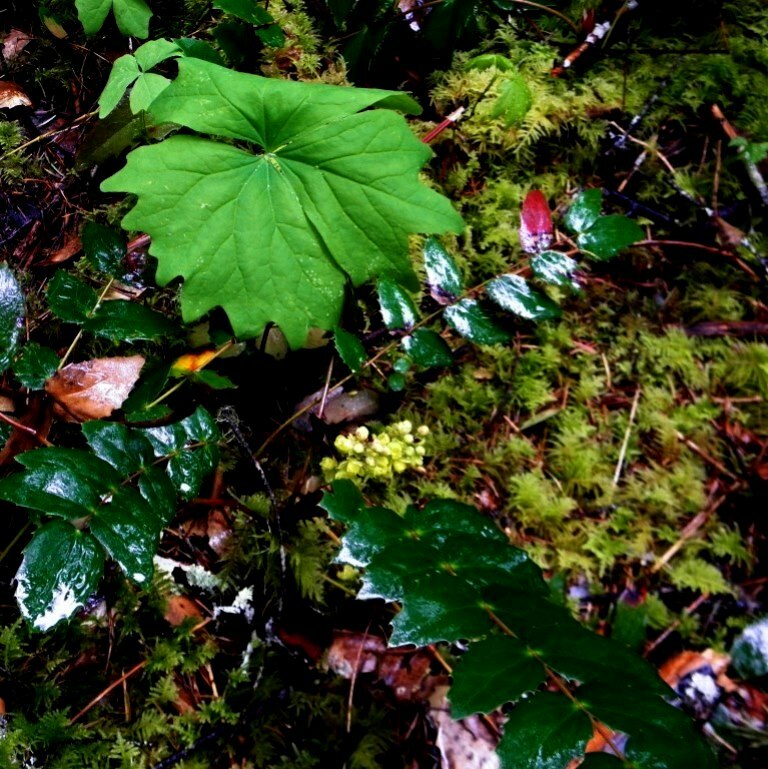 There were ferns, chickweed, mosses, fungus, and a lot of Trail Plants, adenocaulon bicolor, which we always called Pathfinder Plants, because the backs of the leaves are silvery and easily show where someone has walked through them. There were plenty of Cleavers, galium aparine and Avens, geum macrophyllum. 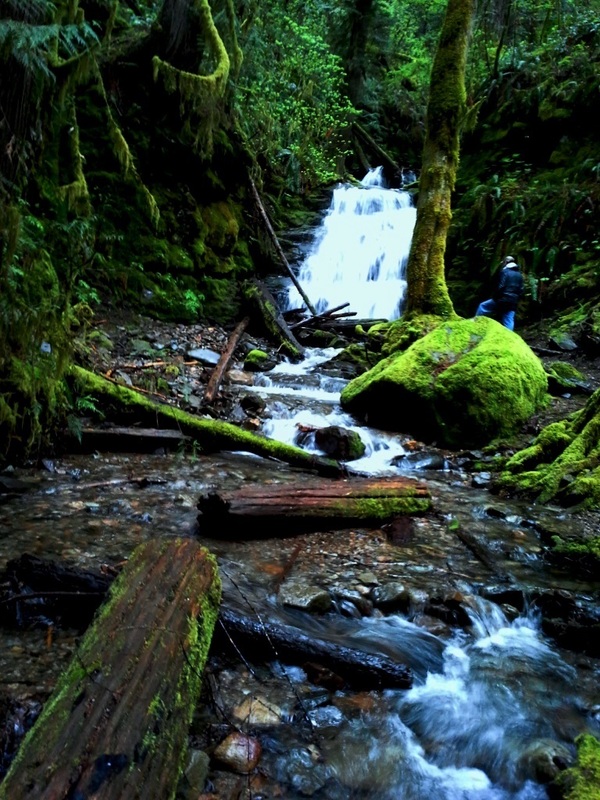 When we walked this trail to the waterfall in March, it was pretty quiet. Today the air was filled with the trilling birds serenading us all along the path. I recognized the American Robins, round from a plentiful diet of worms, and chickadees flitted everywhere and nowhere, never landing long enough, or close enough, for us to catch sight of them. Some spiders had a busy spring weaving webs in interesting places. 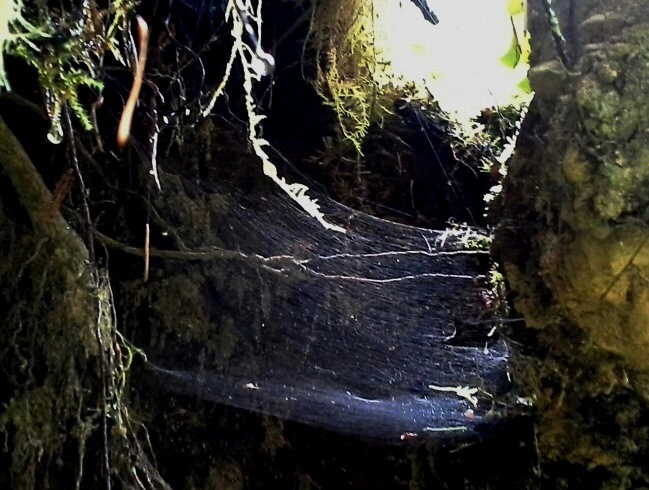 This sturdy web is weaved on the root of a fallen tree, with a ray of sun shining through a hole in the back. 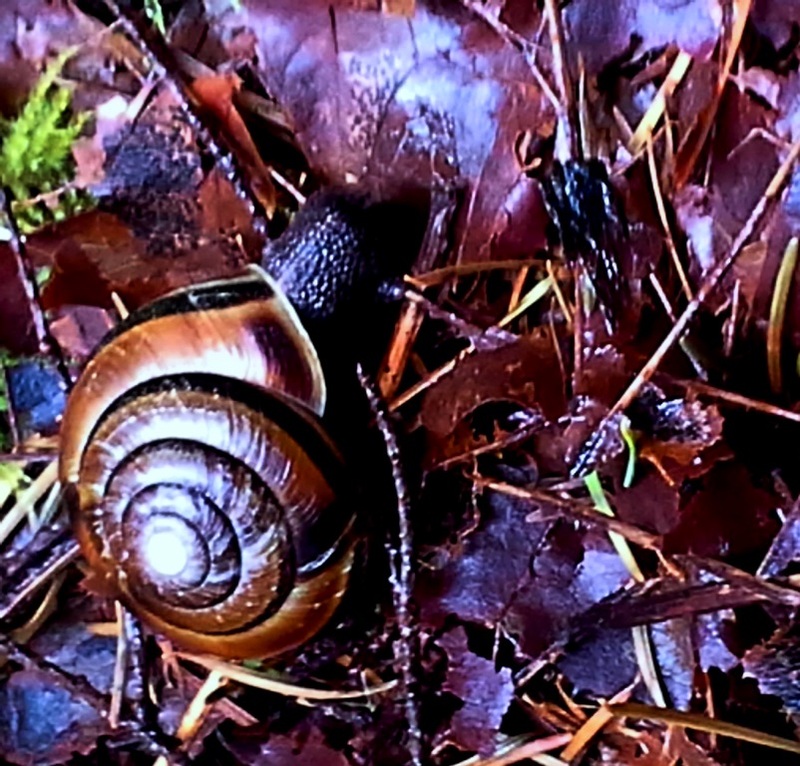 Last, but not least, was a beautiful (to me) snail, Monadenia fidelis, and a couple of slimy Army-green slugs. It has been many years since I walked the woods, then came home and learned about the flora and fauna with my children. Much of it comes back, as I wander through these woods with Kevin, and reacquaint myself with my old green friends. 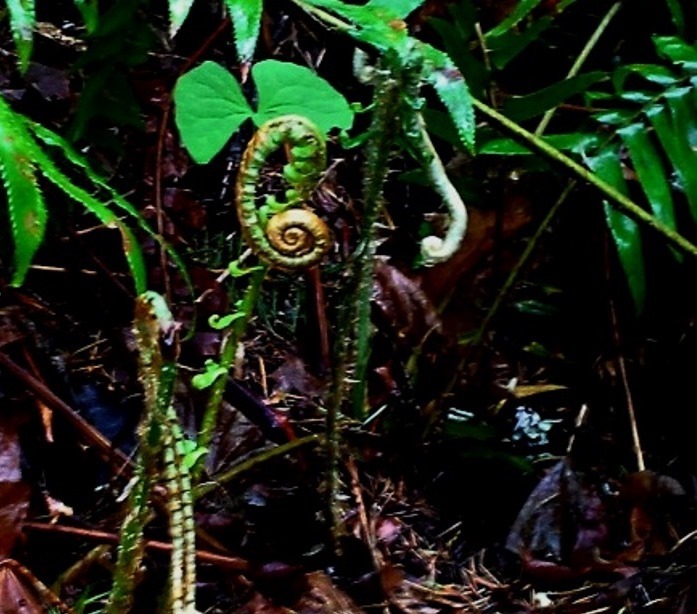 In the past, I have made salads, and medicinal oils, tinctures and salves from wild things in the forest. For now, I’m satisfied photographing and sharing them with Kevin and you. I apologize about all the spaces in this post. 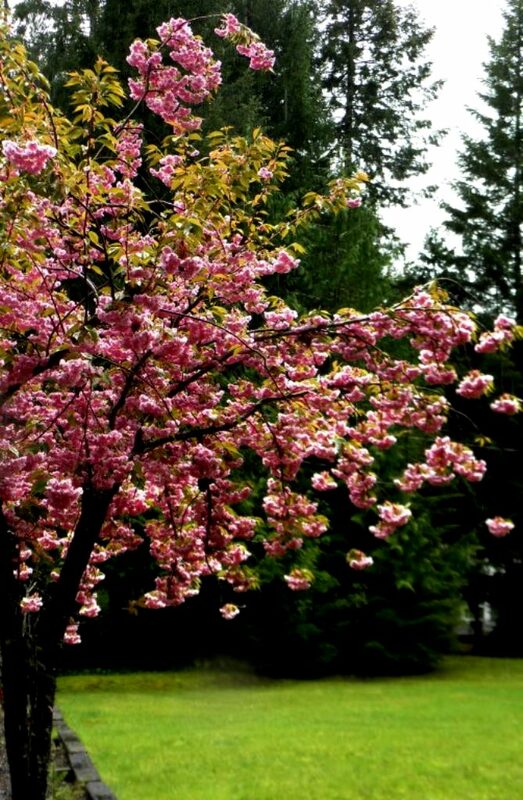 Also see Jill Swenson’s recent post here about spring surprises on the east side of the country. 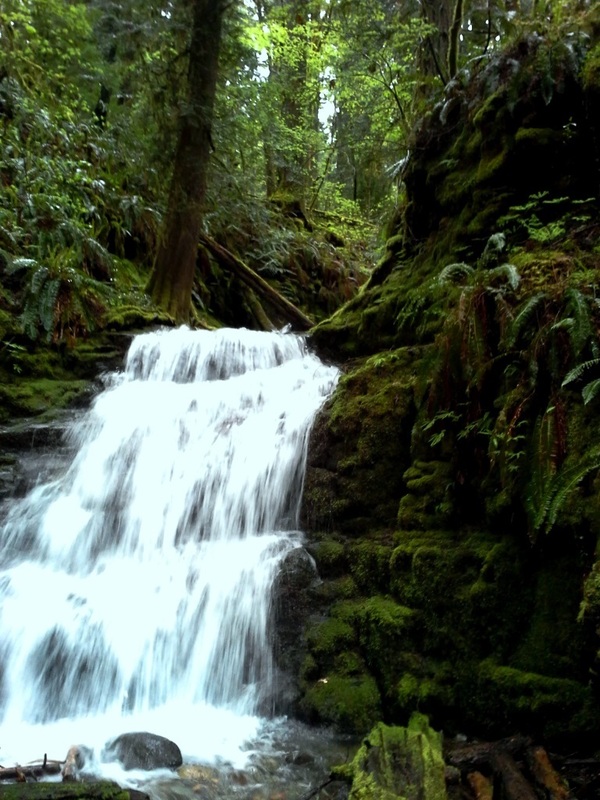 Categories: Phall Photos | Tags: forest, photographs, plants, trees, waterfall, woods | Permalink. Reflective. I liked the space between the photos. Time to ponder. I miss the forests. We have palm trees, sand, mangroves, marsh. I’m glad you like it, Susan, those spaces had me pulling my hair out! I feel better now 🙂 You have warmth though. The price we pay for this chilly, wet beauty is warm weather a few days a year. I gladly pay the price. Love the pictures so much I want to camp out in your garden. It’s a hell of a commute, but come on over, David! This was Mother Nature’s garden, and I can’t wait to see how my secret garden is going/growing… on Monday! Walking in the “wain” with your man – Kevin sounds like a keeper. I enjoyed the woodsy tour and am looking forward to the secret garden tour Monday. By the way, as a photographer you know colors are very saturated on a rainy day – intense and deep. Great work! Thank you so much, Marian! Kevin is a good guy and we have a lot of fun together. We even enjoy just hanging out on these dreary days. 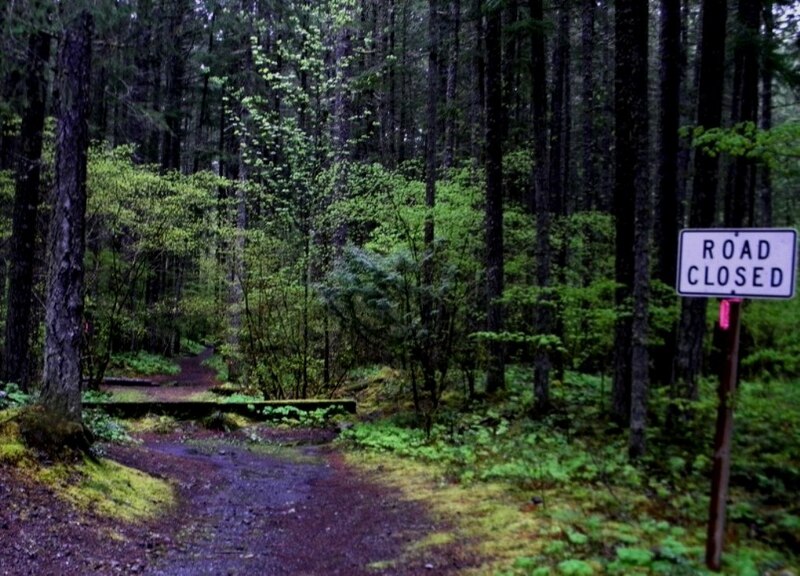 I love the deep saturation in the forest. It is challenging, but better than my issues with the bright sun. So glad you are enjoying. Oh, don’t tell me that! I mean DO tell me that! I have spent hours doing it the clompy way. I will have Sara show me tomorrow. May not be smart, but I have smart friends and kids 🙂 Thanks, M.
I knew the fairy slippers would draw you in 🙂 Yes, we have had a pretty mellow week together and I’m excited to be with my son, daughter and the little grands for the weekend. Thanks for stopping in and hugs back to ya! 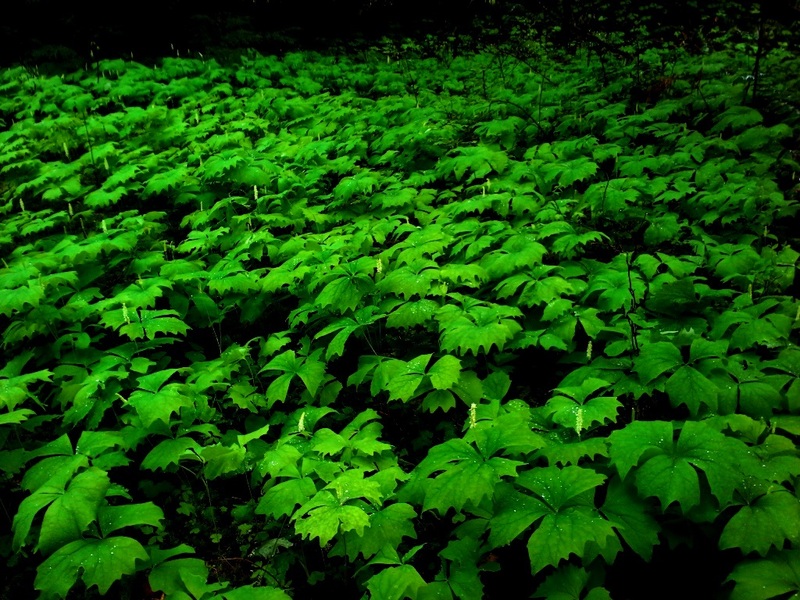 Your knowledge of the forest foliage is pretty cool. You need to get you and Kevin in a frame or two. He IS a winner and you caught at least 2 of the reasons. I’m glad you came along. Can I say that great minds think alike, because we both linked to Jill’s post? Some days WP just goes nutty, I swear I’m doing the same procedure…oh well. I’m glad you can come along on our walks. Please do let me know if you ever get to my neck of the woods so we can take a real walk together. I’m so glad you stopped by again, Jenna and thank you for the kind words. I would think if the mosquitoes like it, the vanilla leaf would! They like pretty heavy shade and composted forest leavings:) Most of the year is rain coat time where Kevin lives, that or snow boots! Thanks for stopping in again, Marie.